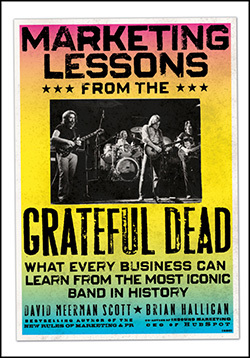 In this excerpt from “Marketing Lessons from the Grateful Dead,” authors David Meerman Scott and Brian Halligan tell us the process in which the Grateful Dead picked a band name, and what companies considering their own brands can learn from them. If you stop to think about it, the name is sorta weird. Even a little scary. But, boy, is it memorable. Originally calling themselves the Warlocks when they formed a band in 1964, the musicians realized they needed to come up with a new name a year later when they found out that there was another band by the same name that had recorded a single. The guys debated names, coming up with ideas such as “Mythical Ethical Icicle Tricycle” (Garcia) and “His Own Sweet Advocates” (Weir). When they were unable to find a name they agreed on, they gathered at Phil Lesh’s house around a copy of Bartlett’s Quotations, read out a thousand possible names, but couldn’t agree on anything. Then Jerry Garcia opened a copy of Funk and Wagnall’s New Practical Standard Dictionary (1956 edition) and randomly pointed to a page. There, staring back at him, was grateful dead. Several members immediately fell in love with the name and wanted to use it. Others were a bit wary. But all agreed it was memorable, so they decided to use it. Love it, hate it, or don’t understand it–whatever you may think of it, the Grateful Dead is a name that you remember. The dictionary defines the term as a type of ballad involving a hero who helps a corpse who is being refused a proper burial, a theme found in many cultures. For the Grateful Dead, the strange cosmic quality the name evokes–a world beyond consciousness–was perfect. This, of course, played into what the band was doing on stage. That some in the audience might be experimenting with mind-altering substances while listening to a band called the Grateful Dead made the name choice interesting on another level. Fast-forward to four decades later and the name seems ideal. The choice of name worked to help advance the Grateful Dead to its widely recognized status as the most iconic band in history. And the sort of inside-joke quality–a name that your parents likely hated and your less-cool schoolmates or coworkers scoffed at–contributed to the community aspect of those in the know. A badge of honor was bestowed upon those who were independent enough to enjoy a band with such an odd name. engine results for your brands. The Grateful Dead teaches us that a memorable name can bring success. Most companies don’t focus enough attention on choosing a memorable name or on the importance of Google, Bing, and other search engines when selecting those names. Typically people closest to the product development effort are the ones proposing the candidate names. This usually leads to overly technical names focused on what a product does (something like “MP3 Deluxe Pocket Player” rather than a memorable name that appeals to customers, like “iPod”). At most companies, candidate names are vetted by the legal department for copyright and trademark issues that would disqualify use, but few bother to do a Google search on the potential new name. If your company’s Web site is not on the first page of the Google results with searches for your product name, that should disqualify it as an option. Excerpted with permission from the publisher, John Wiley & Sons, from Marketing Lessons From The Grateful Dead, by David Meerman Scott and Brian Halligan. Copyright © 2010 by David Meerman Scott and Brian Halligan.